Sophie Gengembre Anderson was born in Paris but her professional life was spent in the United States, England and the Isle of Capri. Sophie, born in 1823, was the daughter of Charles Antoine Colomb Gengembre, a French architect and his English wife. The family lived in what has been described as a “remote part of France” from 1829 to 1843. As a child, she received a couple of art lessons came from an itinerant portrait artist. She later received some training in 1843 from Baron Charles Auguste Steuben. But, for the most part, she was self-taught. Wanting to escape the chaos and unrest following the French Revolution on 1848, the entire Gengembre family, including her two brothers Philip and Henry P., moved in 1849 to Cincinnati, Ohio. Sophie did some work as an illustrator while living in Cincinnati, four or five of her illustrations were included in Henry Howe's Historical Collections of the Great West published in 1851. She also worked for Louis Prang and Company which was known for its chromolithographs. It was while collaborating on an album of portraits of the Protestant Episcopal Bishops of the United States that she met the British artist Walter Anderson. The Gengembre family moved to Manchester, Pennsylvania and lived there for a year or two. She married Anderson while there and the couple was living in England by 1854. The first British exhibition that she participated in was at the Society of British Artists. Her work An American Market Basket was purchased by a gentleman from Manchester. 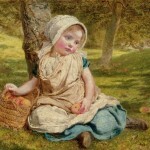 She exhibited regularly at the Royal Society of British Artists and the Royal Academy of Arts between 1855 and 1896. The Andersons returned to Pennsylvania in 1859. A number of her portraits were shown at the Pittsburgh Artist's Association in 1859 and 1860 and in 1860, they both had pieces included at the National Academy of Design. In 1865, the author Louis Carroll, visited the Anderson home a few months before Alice's Adventures in Wonderland was originally published in July. The couple moved back to England until 1871 when they moved to the Isle of Capri. The couple moved back to England, settling in Falmouth, Cornwall in the 1890s. Sophie continued to paint and exhibit her work. Both Andersons died in 1903. While compiling this article for The Famous Artists, I could not find anything other than anecdotal evidence that the couple had any children. Sophie's paintings No Walk Today, Tying the Shoelace, Windfalls and Ladybird Ladybird appear to all be of the same child which some think might be their daughter. 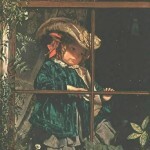 Little Bo Peep was thought to also show the same child. 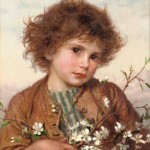 Being married to another artist most likely had a great deal to do with Sophie Anderson's career. Married Victorian ladies simply did not have careers. Sophie was also fortunate that her work was treasured during her lifetime and several of her works were acquired by large municipal museums. 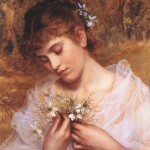 Her work is considered to be pre-Raphaelite in style. Like many of the pre-Raphaelites, her works were known for her strong attention to botanical and other details. Her fine attention to detail give many of her paintings an almost photographic quality. She was successful enough to earn a living from her work and see some commercial success.